THE amount of bushland being cleared by logging in NSW soared last year to the highest level since state-wide records began in 1988. An area equivalent to 138,400 football fields was cleared for crops, forestry or infrastructure, says a government report. "[The] most likely factors relate to market demand and favourable climatic conditions and [they] can be expected to fluctuate over time," a department spokesman said. "It is also possible that recent changes in forestry methods are more readily detectable by satellite monitoring." "The NSW government is currently conducting a review of native vegetation controls," said the chief executive of the Nature Conservation Council of NSW, Pepe Clarke. "They should take this report as a warning - what is required are stronger land- clearing laws that do more to protect the environment, not weaker ones." The Wilderness Society said the government had "failed in its promises to restrain land clearing, resulting in rapid and accelerating degradation of wildlife habitat and water catchments." The most recent State of the Environment report found that there had been no net loss of "woody cover" across NSW between 2003 and 2008. 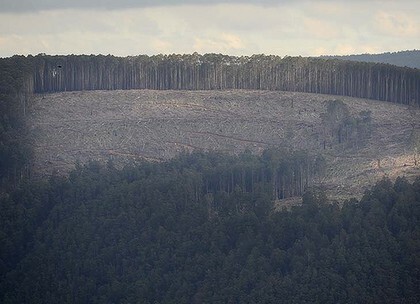 "This is because, although clearing has occurred over that period, there has also been an equivalent amount of regrowth including government sponsored environmental and forestry planting programs conducted by private landholders and state forests, within crown forests areas," the department said. "Notwithstanding no net loss over the whole state, some regions have experienced net declines in woody cover." The report uses the international definition of "woody cover", which includes land at least 20 per cent covered by the crowns of trees higher than 2 metres, a description which would include relatively open country.